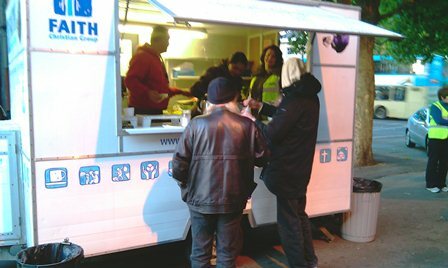 The ‘Tea Bar‘ started going out onto the streets in May 1998 after the closing of the St Andrews drop-in centre on London Road. One purpose of the ‘Candle’, as it was then called, was to reduce the amount of man power required in preparing and serving food in order to free people up to talk to the people we are serving. 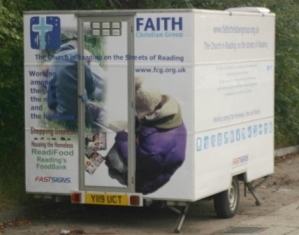 In September 2006 we replaced the ageing “Candle” with a professional catering trailer thanks to some generous donations from SFL Group (previously Sound Foundation), Pangbourne College & Reading Boiler Roomk in Hosier Street on a Sunday afternoon from about 5.30 till 6.30 providing hot drinks of tea, coffee and soup, crisps, sandwiches and biscuits. 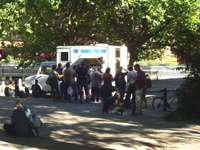 For many years we have been blessed with sandwiches from Pret-a-Manger and Picnic, two sandwich shops in Reading town centre. 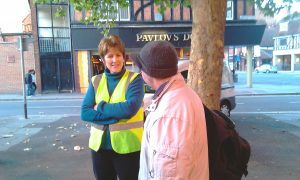 We usually have two members of staff working inside the van, and the rest are free to chat and listen to those coming along, a number which are regularly over 50. Psalm 22 verse  The poor will eat and be satisfied. All who seek the LORD will praise him. Their hearts will rejoice with everlasting joy. The whole earth will acknowledge the LORD and return to him.